Chaumet was founded in 1780 by Marie-Etienne Nitot, one of the most sought-after jewelers of the 18th century, who additionally was an official jeweler to the Emperor Napoleon. Since then, this renowned Parisian fashion house has been producing high jewelry pieces and exceptional designer watches for prestigious clientele from all over the world. Moreover, Chaumet creations, which are made of only the best materials, are considered some of the most elegant and fashionable on the market. It is no wonder that this brand is chosen by such celebrities as Audrey Tautou, Sophie Marceau, Rachel Weisz, and Uma Thurman. For today, Chaumet has many fantastic luxury watches for women in its collection, from classic designs to exclusive high jewelry timepieces created to be worn on the red carpet. In this blog post, we want to introduce several new design watches unveiled by this famous fashion house not so long ago. Enjoy! Inspired by the fire of the Scala de Milan, the Chaumet Aria Passionata is all about passion. 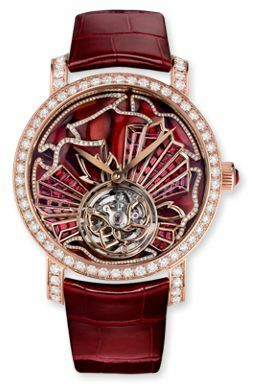 This impressive luxury watch enclosed in a diamond-set 18k rose gold case is distinguished by its Grand Feu red enamel dial decorated with diamonds and rubies. Furthermore, it is powered by a hand-winding mechanical tourbillon movement, which makes this luxurious accessory a true masterpiece of fine watchmaking. 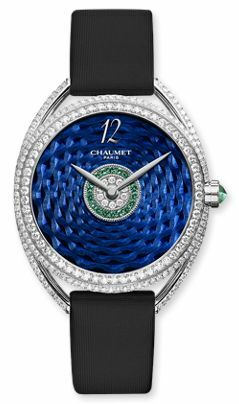 Featuring a night-blue Grand Feu enamel dial with a guilloche décor, which is additionally decorated with diamonds and emeralds, the Liens Lumiere is undoubtedly one of the most gorgeous new design watches in the Chaumet collection. Besides, it comes in a diamond-paved 18k white gold case that houses a precise automatic mechanical movement with a 42-hour power reserve. A true piece of luxury and graceful elegance, the Chaumet Josephine “Rondes de Nuit” is an exceptional luxury watch designed in the company’s signature pear shape. Entirely made of 18k white gold and decorated with brilliant-cut diamonds, this model is distinguished by its amazing bracelet consisting of open-worked pear-shaped links matching the case and the dial. It is powered by a high-precision Swiss quartz movement. 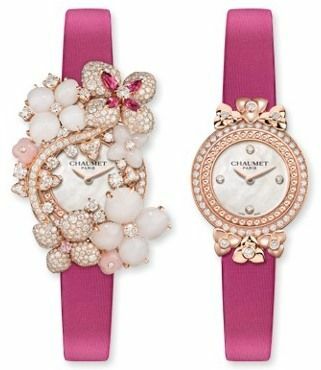 The Hortensia Aube Rosee Brooch is another superb example of Chaumet new design watches for ladies. The fact is that this 18k rose gold quartz watch comes with a very beautiful floral décor that can be removed and worn as a brooch. Moreover, it is adorned with a whole set of precious stones, including diamonds, sapphires, and tourmalines, making it a real piece of exclusive jewelry. Equipped with a sophisticated automatic mechanical movement, the Colombes Creative Complication is one of the most mechanically complex new design watches introduced by Chaumet. 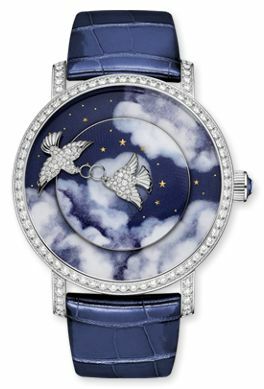 Enclosed in a hand-engraved 18k white gold case, it is distinguished by its night-blue Grand Feu enamel and guilloche dial with sculpted rotating white gold doves showing hours and minutes. Plus, it is decorated with diamonds and features a blue sapphire-set crown. As you can see, all Chaumet new design watches are indeed very impressive, which only confirms the uniqueness of this renowned Parisian fashion house.